Expanding their reach into consumer and business oriented ventures, Computer Cable Store hit a home-run with the full line of Networx SFP Fiber Optic Modules. Technology experts have been touting the benefits of the newest generation of optical modular transceivers, especially as companies like Google and AT&T expand fiber optic networks. Small form-factor plug devices (SFP) offer some of the highest speeds and compactness for costly networking equipment. Now, Computer Cable Store is making these types of devices more accessible to help customers achieve the fastest data transfer speeds possible when the easing of use, repair, and cost efficiency is of the essence. Over time, the use of the SFP type devices can substantially reduce a business' networks costs, paying for itself many times over. Businesses can use the same network and only swap out backbone fiber for SFP modules that are compatible with practically any device. 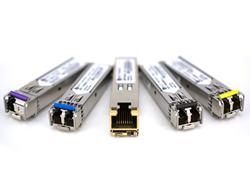 SFP transceivers are much easier to use than old fashioned soldered-in modules. Now, small and medium businesses can avoid spending large sums of money to overhaul outdated systems, instead opt for modules that are easily replaced or hot- swapped when necessary repairs or maintenance needs to be performed. This exponentially cuts costs when it comes to maintenance and the efforts required to perform localized upgrades. Computer Cable Store reports that the costs of these devices can vary considerably; from basic devices under $50.00 to more robust models costing $350. These costs savings can save smaller companies with fewer resources great sums of money in the long run compared to potential maintenance or repair of much more intensive network functionalities.